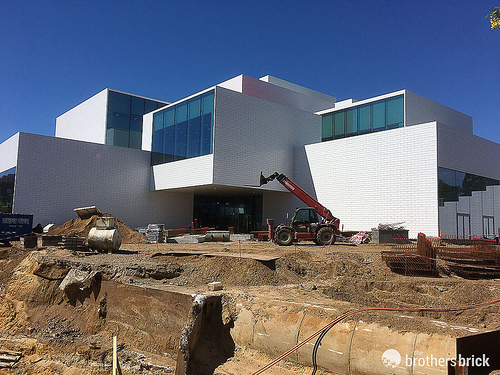 The Brothers Brick recently got to visit LEGO House as it enters the final stages of construction prior to the grand opening on 28 Sept 2017. 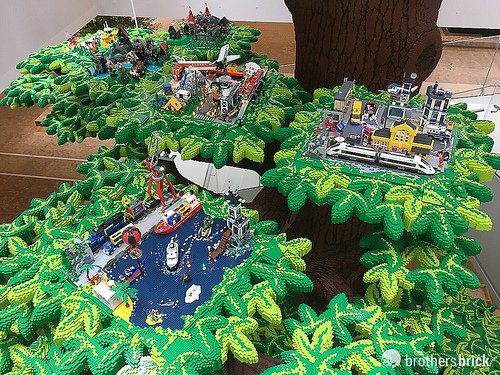 We got a behind-the-scenes peek at some of the impressive models, displays, and creative experiences that will form LEGO’s ultimate play date. 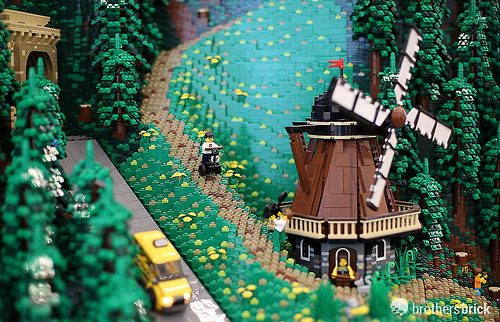 LEGO House is located in the centre of Billund, only 3km away from Billund International Airport. Fans who visit the new attraction will be able to build their own version — without the need for diggers or a fork-lift. 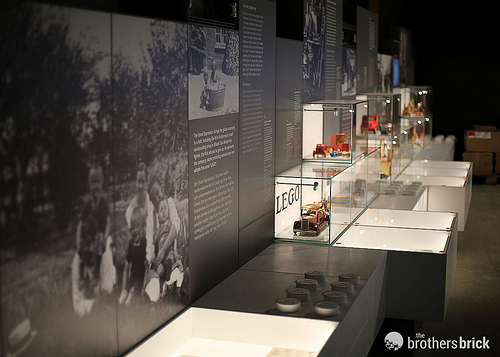 As we took a look around, Jesper Vilstrup, General Manager of LEGO House, told us a new, “bigger and better” exclusive LEGO House set will be released in September when the doors open to the public. 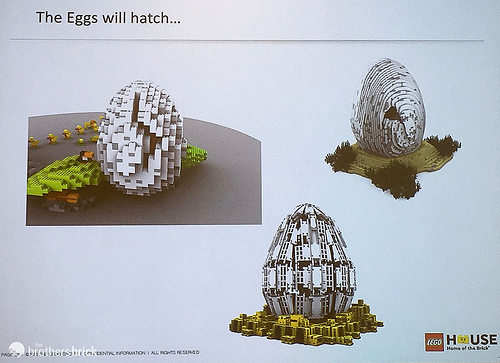 This will replace the current 250-piece set 4000010 LEGO House which can still be purchased from a handful of local Billund shops. As we entered LEGO House, the impressive 15m tall Tree of Creativity dominated the central staircase. 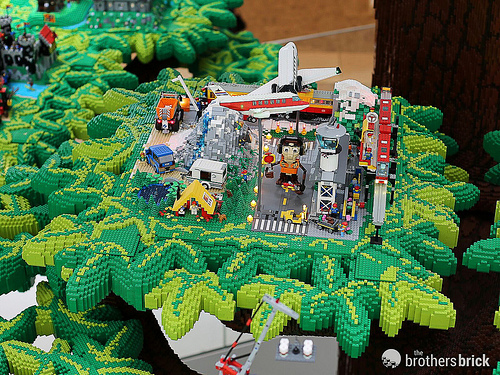 Packed full of LEGO details, the Tree is a unique model, built by hand from 6,316,611 standard bricks. 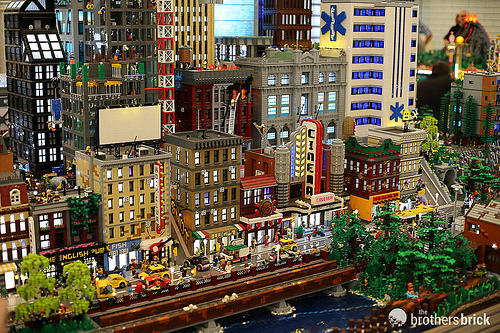 It apparently took 24,350 hours to assemble… phew! 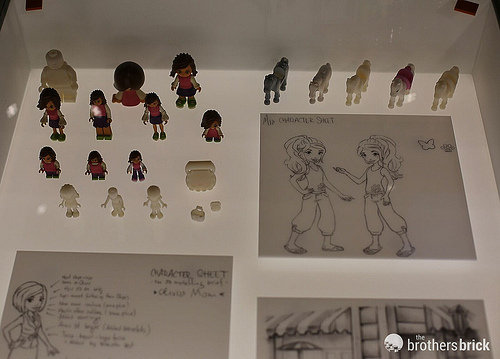 As one ascends the staircase, there are scenes representing themes and ideas that have been developed by the LEGO Group over the years. 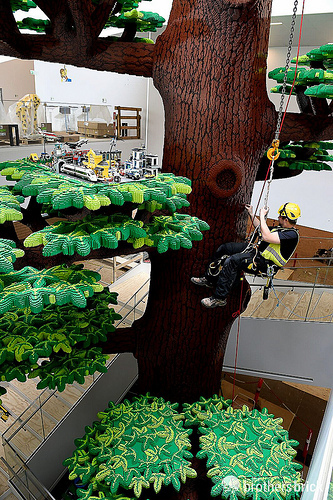 The base and roots of the tree represent the LEGO Group foundation in wooden toys, and up at the very top LEGO minifigure workers are building new branches using a giant crane. The branches in between are decorated with lovely dioramas, each evoking a different theme. Stuart Harris has worked for the LEGO Group for many years, starting as a Master Builder in LEGOLAND Windsor and now Senior Experience Designer. He has a key role in the design of the builds within LEGO House. 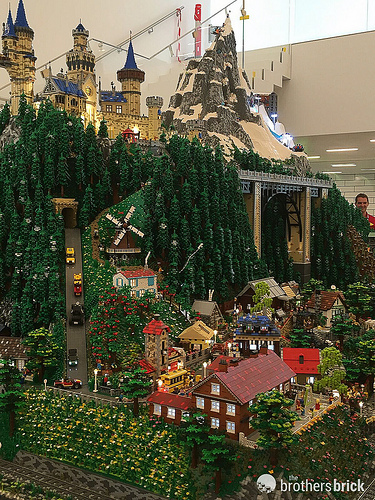 He described the massive minifigure-scale model in the Masterpiece Gallery as “..if you gave an AFOL an infinite number of bricks and an infinite number of time to build…” The huge model has everything from a snow-capped mountain, through to a metropolis and busy shipping dock. It really has to be seen to be believed! If you look closely, Kjeld Kirk Kristiansen (the former president and CEO of The Lego Group and grandson of founder of LEGO, Ole Kirk Kristiansen) makes a cameo appearance on what appears to be an off-road Segway. 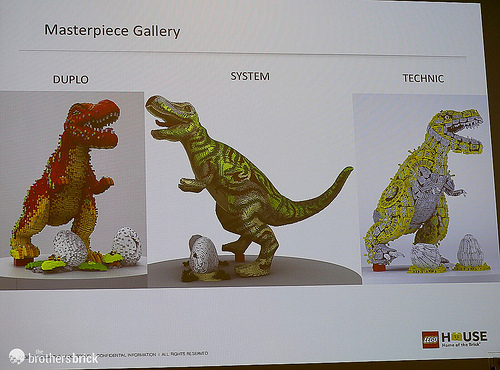 Three other important models feature within the Masterpiece Gallery — a trio of huge T-Rex models, one made from System parts, another from Technic parts, and finally one of Duplo. This initial image was taken from a presentation given by Stuart Harris and more images follow to allow a closer look at these massive dinos — each made of between 250,000-300,000 parts. 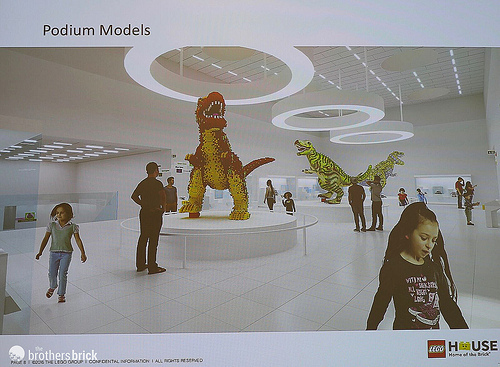 The dinosaurs will dominate the central area of the LEGO House, standing upon podiums amongst displays of models from 21 adult fans invited to create something for the grand opening. 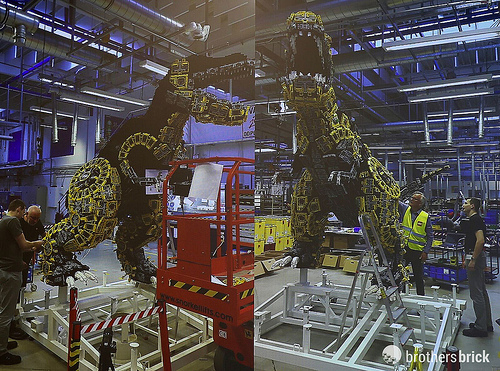 The dinosaurs were developed in conjunction with LEGO fans who shared their ideas for parts to use, and thoughts on how to create a real WOW-factor. The idea behind the pose is What makes a dinosaur roar? — and each one is standing on an oversized LEGO brick! Each T-Rex also guards an egg that will ‘hatch’ at some point during the opening. What’s inside? LEGO wouldn’t say. Finally, down in the basement was a vault of LEGO history with lots of information, displays, and an interactive library of LEGO sets. 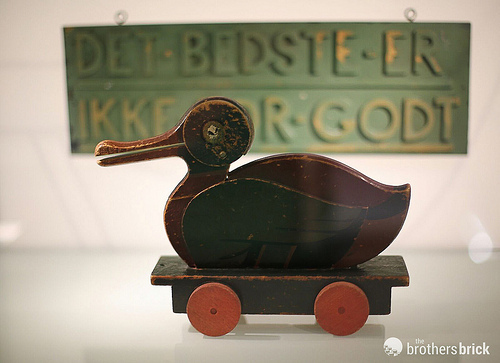 The displays were still being built and the interactive LEGO library was yet to come online, but we did see some of the first initial wooden models created by Ole Kirk Kristiansen. 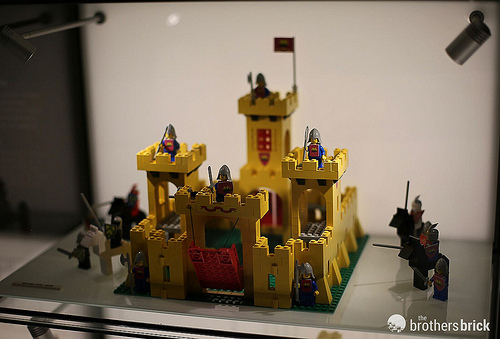 There were also concept design models of minidolls from the Friends and Elves themes, and the 375 Castle set first produced in 1978. 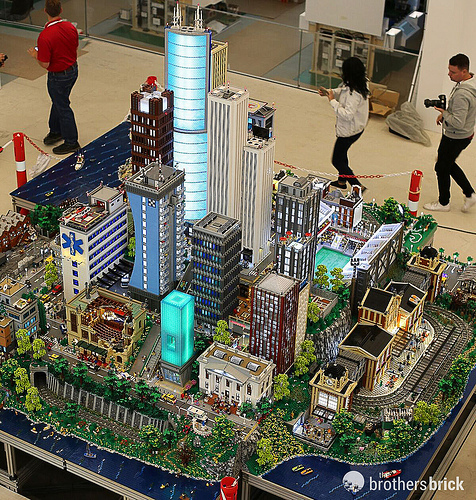 While there is still a fair bit of work to be done within LEGO House, the space is already filling up, and some impressive models are in place with lots more to come. Jesper Vilstrup confirmed everything was on schedule for the grand opening. There was certainly a lot of activity and construction work still going on during our visit. 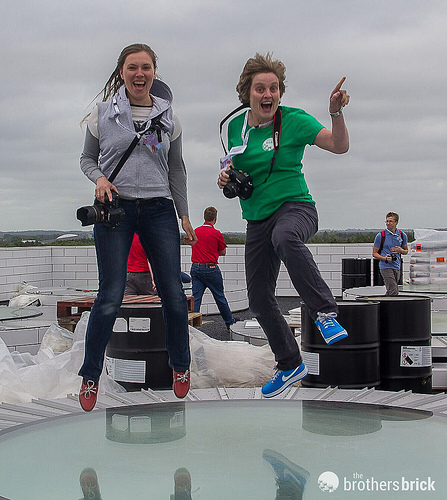 TBB and Vera (representing the Russian LEGO forum Phantoms) decided to put some of it to the test — taking to the glass-topped roof for a quick integrity assessment. Thankfully it passed our jump test! This place looks awesome! Unfortunately, I’m not going to travel halfway around the world to visit it. I went to Legoland Billund a few years ago with the family and we stayed at the campground in a great little cabin. Because it was not technically part of Legoland, the campground store sold the LEGO House sets which they had already made before they even broke ground on the real building. Bought a bunch thinking that I could sell them once I got back to the States, and while I did make a profit I was amazed at how many people had the same idea. 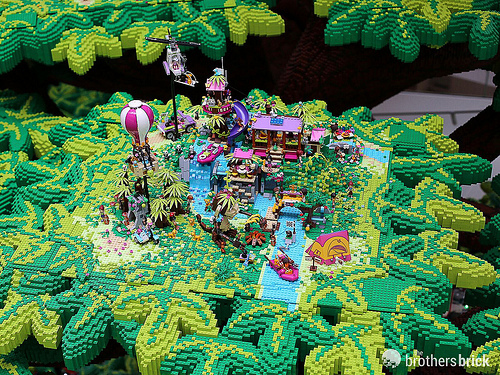 Now I want to go back there to check out this amazing temple to LEGO (and get the new version of the set 8-) Not sure that I can convince my family to go again though!